Davide Rebellin's appeal against the decision of the Executive Board of the International Olympic Committee (IOC) to strip away his silver medal from the 2008 Olympic Games in Beijing has been rejected by the Court of Arbitration for Sport. The decision by the committee last November forced the Italian to return the medal and the €75,000 prize he received. He complied with the request, but maintained his innocence in the matter. "I've never taken Cera. One of the strange things is that there are seven samples attributed to me," Rebellin questioned. "How can that be when I have only had three doping tests?" He was one of five athletes who tested positive for the blood-boosting drug during retroactive testing of the Beijing blood samples. The IOC said in a press release earlier this year that it had contacted the International Cycling Federation (UCI) to "change the results in the mentioned event, as the rules allow it and to consider subsequent actions that are in its competency." 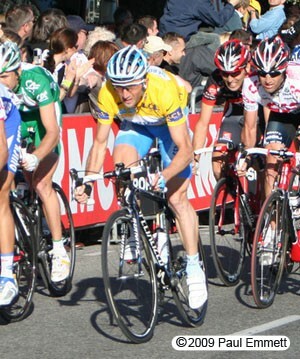 The changes saw Swiss Fabian Cancellara awarded the silver medal and Russian Aleksandr Kolobnev received the bronze. Rebellin was questioned by the Italian Olympic Committee's (CONI) anti-doping prosecutor in January at the Rome at Olympic stadium. After the meeting Rebellin's lawyer, Federico Cecconi, confirmed that the CONI proceedings against Rebellin would be suspended until after the ruling by the Court of Arbitration in Sport (CAS). His appeal from last December was heard before CAS last month in Lausanne, Switzerland and, now that the decision has been made, the case will now go back to CONI so they can follow through with his sanction.